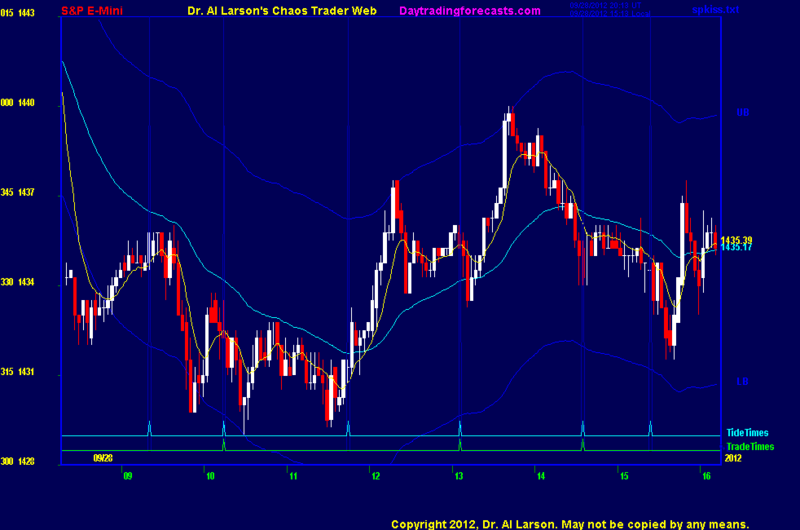 11:14 in 2007, I did a year long real time study of an indicator taught in the Chaos Trading Made Easy course. It taught me that a pattern like today is basically a "hold short to close pattern"
10:01 on the MTRainbow chart, all the EXMA's are down. 9:12 overnight trading has erased yesterday's rally. Prices are holding above yesterday's low. so I expect a limited range, probably from about 1432 to 1443. 9/28/2012 1:49:19 PM MT JMV****:: There, I just sent you a rather lengthy email, I'm chatty like that hehe, I'm all done here. See you all next week! 9/28/2012 1:34:52 PM MT BBB****:: Don't call me sir, I work for a living! 9/28/2012 1:18:17 PM MT JMV****:: Will do sir! 9/28/2012 12:46:14 PM MT BBB****:: JMV what are the cycle indicators you are using? 9/28/2012 12:31:43 PM MT JMV****:: ...And there's the big cahoona, hoping we get another buyable rally!! 9/28/2012 12:05:23 PM MT BBB****:: Al, the +T000 Flux and the -T000 flux: now that we are above it would you expect the -T000 flux to be resistance and look to cover there ? 9/28/2012 11:48:33 AM MT AG:: I'm done for the day too. Have a great weekend everyone. Thanks as always Al. 9/28/2012 11:28:49 AM MT BBB****:: It's because he gets cheap Singapore Slings! 9/28/2012 10:44:39 AM MT Tg****:: Thanks for the CCT room response Al. Good luck for the rest of the day and have a great weekend. Shutting down early tonight. 9/28/2012 9:32:49 AM MT Tg****:: Al, could you elaborate in the CCT room on this comment: In 2007, I did a year long real time study of an indicator taught in the Chaos Trading Made Easy course. It taught me that a pattern like today is basically a "hold short to close pattern"
9/28/2012 9:13:58 AM MT JMV****:: Al, one question. in the instructions it says to cover a trade if it stalls for over 45 mins, well this thing has been dead that long, what's your reasoning for holding on to this? 9/28/2012 8:33:02 AM MT AG:: I had a ridiculously good fill on that one (33.75) but stopped out b/e. 9/28/2012 8:00:20 AM MT BBB****:: Heres my number, call me maybe?